DETROIT (AP) Detroit Pistons rookie Luke Kennard took advantage of his opportunity to play clutch minutes for coach Stan Van Gundy. Kennard finished with 14 points off the bench, shooting 6 of 11 from the field, including 2 of 5 from 3-point range, helping the Pistons to a 112-103 victory over the Miami Heat on Sunday. At 10-3, Detroit is second behind Boston in the Eastern Conference and off to its best start since going 15-3 in 2005-06. The Pistons swept a five-game homestand. Tobias Harris had 25 points, Avery Bradley scored 24, Reggie Jackson had 17 points and Andre Drummond added eight points and 17 rebounds for the Pistons. Detroit used a 10-0 run midway through the fourth quarter to pull away. The Pistons led 58-55 at halftime and 83-81 entering the final quarter. They opened a 91-86 edge after Kennard’s jumper. Later, after a 6-0 run got Miami to 93-92, Kennard hit consecutive shots – a runner and a 3-pointer – to make it 98-92 with 7 minutes left. Van Gundy was an assistant with the Heat from 1995-03 and the team’s head coach from 2003-06. Pistons assistant Tim Hardaway played for the Heat from 1996-01 and his No. 10 Miami jersey was retired. … Heat assistant Juwan Howard played college basketball at Michigan. Heat: Former Michigan point point Derrick Walton Jr., now a rookie with Miami, attended Michigan’s home basketball game Saturday night in Ann Arbor and was part of a pregame banner ceremony to recognize the Wolverines’ Big Ten tournament title last season. He did not play in Sunday’s game at Little Caesars Arena. … G/F Rodney McGruder (left tibia) did not play. Pistons: Starting small forward Stanley Johnson (right hip flexor strain) missed Sunday’s game, his third in a row. 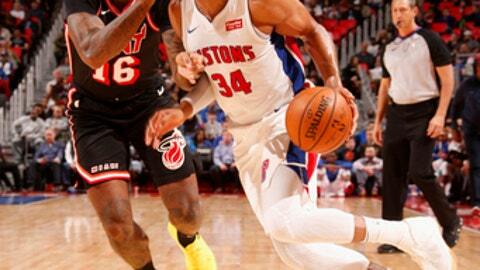 Van Gundy is hopeful Johnson will return for Detroit’s game at Milwaukee on Wednesday. … F/C Jon Leuer (left ankle) also did not play against the Heat.